How Do I Know If I Have Peritoneal Mesothelioma? Peritoneal mesothelioma is caused by asbestos. Most doctors believe it is caused from ingestion of asbestos fibers and that microscopic asbestos fibers become embedded in the abdomen (peritoneum). After about 20-50 years, these fibers can cause inflammation and mutations in the healthy mesothelial cells and these mutations ultimately cause these cells to become cancerous, thus, forming tumors in the peritoneum. Patients who are diagnosed with peritoneal mesothelioma may survive several or more years after diagnosis and there are long term survivors. This cancer occurs in less than 1,000 people in the United States every year. Rates of this mesothelioma vary throughout the world and are highest in Australia and the United Kingdom. Diagnosis typically occurs in people over the age of 65, but peritoneal mesothelioma has occurred in people much younger. • ascites (fluid in the peritoneum). Although all of these signs, symptoms, and conditions may be caused by other medical conditions, if any of these become evident, especially if you have been exposed to asbestos, it is important to consult a physician immediately to make a definitive diagnosis. Diagnosis of peritoneal mesothelioma can be extremely difficult due to the non-specific nature of the signs and symptoms. Many of these signs and symptoms can be associated with other medical conditions. Therefore, several diagnostic tests may be employed in order to obtain a definitive diagnosis of peritoneal mesothelioma. Imaging scans, such as CT and MRI, can be used to detect tumor masses. Blood tests can be used to detect biomarkers and abnormal substances in the bloodstream. And an abdominal biopsy can be used to obtain a tissue sample and confirm a diagnosis of peritoneal mesothelioma. In the absence of these diagnostic tests, peritoneal mesothelioma is commonly misdiagnosed as irritable bowel syndrome (IBS), hernia, or other types of abdominal cancers (especially ovarian cancer in women). A definitive diagnosis can only be made through a series of diagnostics tests, including a biopsy. Another aspect involved with a diagnosis of peritoneal mesothelioma is staging of the cancer. For peritoneal mesothelioma there is no defined staging system, therefore, physicians may attempt to determine how advanced the disease is using relevant criteria. The latest advances in medicine allow physicians to diagnose peritoneal mesothelioma earlier than ever before. However, even the most experienced cancer doctors may have difficultly accurately diagnosing peritoneal mesothelioma because the process of obtaining a definitive diagnosis can take time. The process of diagnosing peritoneal mesothelioma is similar to the process of diagnosing other forms of mesothelioma. The process begins with a thorough examination of the patient’s medical history, occupational history, and overall physical condition. Due to the non-specific nature of the symptoms associated with this cancer, a history of asbestos exposure can be helpful (but not necessary) in arriving at an accurate and definitive diagnosis. Once the medical history, occupational history, and physical exam have taken place, diagnostic testing such as imaging scans and peritoneoscopy usually occur to obtain a definitive diagnosis. When a patient is experiencing symptoms associated with peritoneal mesothelioma, such as pain or swelling in the abdomen, the physician will commonly order a chest x-ray, CT scan, or another type of scan. Imaging scans such as these will identify any potential tumors. Imaging procedures also help doctors determine the appropriate sites to perform biopsies. 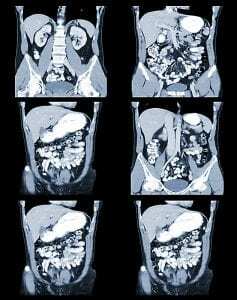 CT scans can also be useful in the diagnosis of ascites (fluid in the abdomen). Although the use of imaging scans is useful in the process of diagnosis peritoneal mesothelioma, this cancer can often be confused with an abundance of gas which can result in a misdiagnosis. Due to this phenomenon, physicians will commonly order a procedure known as a peritoneoscopy to confirm the presence of peritoneal mesothelioma. A peritoneoscopy is a procedure in which a surgeon inserts a small camera through a small incision in the patient’s abdomen. The use of the camera allows the physician to find, see, and extract a tissue sample from the tumor. Once the tissue sample has been obtained, the sample is sent to a laboratory for testing by a pathologist. This step is critical because peritoneal mesothelioma may appear to be very similar to other tumors. Therefore, pathologists can confirm the diagnosis of peritoneal mesothelioma after running a series of specific tests to differentiate peritoneal mesothelioma from other forms of cancers. What Is The Best Treatment For Peritoneal Mesothelioma? Peritoneal mesothelioma accounts in about 20-25% of all mesothelioma cases. Patients diagnosed with peritoneal mesothelioma have longer life expectancy than those with other types of mesothelioma and some studies report patients live up to 5 years after treatment. Patients diagnosed with peritoneal mesothelioma most often receive cytoreductive surgery with heated intraperitoneal chemotherapy (HIPEC). This combination of treatments is also generally referred to as multimodal therapy. Cytoreductive surgery is currently the only surgical option available for patients with a diagnosis of peritoneal mesothelioma. During this surgery, surgeons are able to remove visible mesothelioma tumors that are in and around the abdominal cavity, as well as any other visible signs of cancer. Peritoneal mesothelioma may often be comprised on many small tumors that can be difficult to see. Because of this, the procedure is highly complex and may take up to 10 hours to complete. What is Heated Intraperitoneal Chemotherapy (HIPEC)? Heated Intraperitoneal Chemotherapy (HIPEC) is the combining of surgery and chemotherapy. During a HIPEC procedure, a heated mixture of chemotherapeutic drugs are introduced directly into the abdominal cavity shortly after the completion of the cytoreductive surgical procedure. The overall goal of HIPEC is to eliminate any microscopic traces of peritoneal mesothelioma that may remain after surgery. In order to perform HIPEC, the mixture of drugs is typically heated to a temperature of 104 to 107 degrees and circulated inside the abdominal cavity for a maximum of two hours. This time period is critical so that the chemotherapeutic drugs have enough time to incorporate into the microscopic peritoneal mesothelioma cells, which increases the cancer-killing capabilities of the drug mixture. HIPEC may be given only once, or can be repeated as many times as the treating physician deems necessary. Once recent report states that patients who receive multiple courses of HIPEC after a single cytoreductive surgery experienced longer survival times than those patients who only received a single course of HIPEC. Radiation therapy is sometimes used in patients with peritoneal mesothelioma. This type of therapy works best when it used in conjunction with other treatments such as surgery. Patients in the early stages of peritoneal mesothelioma may receive radiation treatments in combination with surgical treatments. Patients with advanced peritoneal mesothelioma may also be administered radiation therapy for pain relief. Paracentesis is an invasive procedure in which a needle is introduced into the peritoneal cavity in order to remove the build-up of fluid (ascites) in the abdominal cavity. Paracentesis is used strictly to relieve pain and discomfort associated with pleural mesothelioma and is not meant to be a curative treatment. Many mesothelioma patients seek out alternative treatments and approaches such as vitamin therapy, dietary therapy, mind-body medicine, Traditional Chinese Medicine, and cannabis oil. None of these approaches are FDA approved for cancer but there are anecdotal reports of mesothelioma patients getting helped by these approaches. A physician should be consulted prior to initiating any alternative or complementary treatment to avoid any potential drug interactions. How Can I Get Help For My Peritoneal Mesothelioma? Receiving a diagnosis of peritoneal mesothelioma can be devastating physically, emotionally, and financially. During this extremely stressful time, it is crucial for mesothelioma patients and their caregivers to surround themselves with people they love and trust. The success of coping with this rare and aggressive medical condition is largely based on whether your medical, emotional, and financial needs are being met. Patients diagnosed with peritoneal mesothelioma, as well as their caregiver, need a great deal of emotional support. Support groups put people in touch with other patients and families who have had to deal with a mesothelioma diagnosis and can truly empathize with your situation. This can offer patients and caregivers peace of mind knowing they are not alone in this difficult challenge. Veterans can develop mesothelioma as a result of asbestos exposure during their military service. As many as 30% of all Americans diagnosed with mesothelioma are veterans who were exposed while on active duty. Veterans who develop mesothelioma as a result of their service in the military may be entitled to benefits and assistance from the U.S. government. In addition to financial benefits from the Veterans Administration (VA), the VA may also offers benefits to support veteran caregivers as well as compensation for dependents of a mesothelioma patient. People who have been recently diagnosed with peritoneal mesothelioma, or any asbestos-related disease, should immediately contact a mesothelioma attorney. A person diagnosed with mesothelioma can file a personal injury lawsuit against a company that may be responsible for exposing them to asbestos. Filing a mesothelioma lawsuit is a time sensitive process and choosing a lawyer trained in asbestos litigation is essential. It should be noted that most mesothelioma lawsuits never go to trial because they are settle out of court before a trial can take place. In addition bankruptcy trust funds may be available from bankrupt companies. Receiving a diagnosis of peritoneal mesothelioma can be devastating emotionally, physically, and financially. This is a battle should cannot and should not be fought alone. Support groups, the Veterans Administration, and lawyers trained in asbestos litigation are all resource in which mesothelioma patients and their caregivers can rely upon to support them in the fight against this rare and aggressive disease. There is a lot of depressing information on the internet about peritoneal mesothelioma and the survival associated with this cancer. To help balance some of this negative information, we present some case histories of long-term peritoneal mesothelioma survival as published in the peer reviewed medical literature. In November 1979, a 73 year-old man had abdominal pain and distension and was found to have an abdominal mass. A laparotomy was performed that revealed peritoneal malignancy with ascites. A biopsy demonstrated that the tumor was malignant peritoneal mesothelioma. No special treatment was recommended other than draining of the ascites. In spite of the continuing ascites and the gradually-enlarging abdominal masses, the patient enjoys good health, and lives independently at home. How many more years (in excess of 9) this patient lived with peritoneal mesothelioma is not known. See: Norman, P.E. and Whitaker, D., Nine-Year Survival in a Case of Untreated Peritoneal Mesothelioma, Med J Aust 1989; 150: 43-44. A woman was diagnosed with peritoneal mesothelioma. She had surgery (“total excision”). Seven years later the peritoneal mesothelioma recurred and she had another surgery (“reexcision”). She remains well 15 years after the initial diagnosis. The patient did not receive chemotherapy. See: Asensio, J.A., et al., Primary Malignant Peritoneal Mesothelioma: A Report of Seven Cases and a Review of the Literature, Arch Surg; Nov 1990, 125, 1477-1480. In 1962, a 31 year-old woman had abdominal pain for several months and a mass was detected. She underwent exploratory laparotomy which found tumor nodules spread throughout her abdomen. The diagnosis of peritoneal mesothelioma was made. Complete surgical removal of the tumor was not possible. She was treated with radioactive phosphorus, radiation, and oral chemotherapy (cytoxan). She remained well for 17 years. In 1979 she had recurrent peritoneal mesothelioma. She was treated with cytoxan again and continued to live as of the writing of the published medical report. See: Brenner, J., et al., Seventeen Year Survival in a Patient with malignant Peritoneal Mesothelioma; Clinical Oncology 1981, 7, 249-251.